Welch's grape juice, made from concord grapes, offers a sweet flavor with no added sugar. The company website notes that each 8-oz. glass is made from at least 40 grapes and counts as two servings of fruit. This beverage contains quite a few calories, but it does offer vitamin C as well as other benefits. An 8-oz. 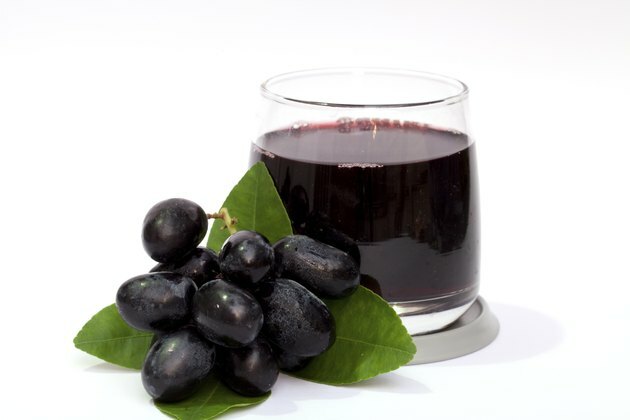 serving of Welch's grape juice contains 170 calories. This is high in calories for a beverage, and it accounts for 8.5 percent of the calories you may consume each day. Consider eating a handful of grapes if you crave the sweet flavor instead of drinking juice -- it saves calories and offers better nutrition, including fiber. One serving of this juice introduces 42 g of carbohydrates into your meal plan; you should consume 225 to 325 g of carbs each day. Drink a serving of Welch's grape juice, and you satisfy your entire daily requirement for vitamin C. With 100 percent of the daily recommended intake, this juice may offer immune system benefits. A study published in the October 2004 issue of "Cochrane Database of Systematic Reviews" indicates that vitamin C does not prevent colds except in specific cases -- in those subjected to cold temperatures or those who partake in vigorous exercise, all for short durations. Researchers note that one study revealed that participants who took a dose of 8 g of vitamin C each day experienced a reduction in cold duration when the vitamin was taken at the onset of illness. While drinking Welch's grape juice may not help prevent you from getting sick, but it may help you get over your cold sooner. Welch's grape juice contains 40 g of sugar per serving. The Welch's website claims that all of this sugar derives naturally from the grapes. While natural sugars should not negatively impact your health, other types of sugar may -- added sugars are associated with weight gain, generalized inflammation in your body and tooth decay. The American Heart Association advises keeping your sugar intake to 25 g per day for women and 37 g per day for men. Juice made from concord grapes, as Welch's grape juice, is good for your immune function. Evidence in the January-February 2011 edition of the "Journal of Medicinal Food" correlates the consumption of concord grape juice with increased antioxidant levels and immune cells. The study included 85 middle-aged participants instructed to drink juice every day for a nine-week period. Consult your physician before drinking Welch's grape juice to boost your immunity. What's the Best Juice for Colds?